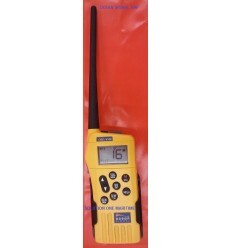 Ocean Signal Survival VHF Radio & Accessories There are 2 products. Ocean Signal V100F Survival Radio, VHF Multi-Channel, OSVHF101M The SafeSea V100 survival craft hand portable radiotelephone meets all the requirements of the IMO for carriage on SOLAS ships. Designed to be ultra-rugged and easy to use, both on-board and in distress situations, the V100 is the ideal choice for mandatory and voluntary carriage. Ocean Signal V100F Survival Radio, VHF Multi-Channel, OSVHF100M The SafeSea V100 survival craft hand portable radiotelephone meets all the requirements of the IMO for carriage on SOLAS ships. Designed to be ultra-rugged and easy to use, both on-board and in distress situations, the V100 is the ideal choice for mandatory and voluntary carriage.